In analyzing the relationship between a “global public sphere” and social media on the African continent, the generalizations hide a far more interesting set of observations. Debates and discussions about what passes for a global public sphere often overlook and obscure dynamics of power or take themselves too seriously. What is defined as the global public sphere by most observers and scholars is still very much limited to the industrial north (especially the United States and United Kingdom) and their public and private broadcasting systems, twitter handlers, and blogs. The term also refers, by default, to debates and deliberation solely in English. In contrast, what transpires with media in the Global South, especially social media, is far more interesting. Part of the reason may be that the normative notion of the “public sphere” taken from Jurgen Habermas is linked to Western notions of democratic and “rational” free debate. Much of the excitement around social media follows the success of social movements in the overthrow of the dictatorial regimes in Tunisia and Egypt. Known colloquially as “the Arab Spring,” it is clear that these outcomes were the result of a range of other factors that were very specific, and beyond the realm of generalizations about the global public sphere. These factors include the nature of the regimes (i.e., family dynasties); the role of armed forces (who quickly joined or tolerated the protests); the degree of state repression; long histories and deep levels of social movement organization (from varied groups like the Muslim Brotherhood and trade unions to the young Internet types that laid the groundwork for the protests beginning in January 2011 in Egypt); and political culture and the role of religious identities. It is also important to look at factors such as different levels of urbanization and the more prominent role of a middle class and their connection to social media in North Africa. For example, Egypt has a vibrant blog and Facebook culture that predates Tahrir Square by a number of years. Finally, Al Jazeera, especially its Arabic service, was decisive in the Arab Spring and the outcome of the civil war in Libya. Sub-Saharan African political and media conditions could not be more different from those in the north: for one, we’re talking about a range of different regimes, including ones where the transition to democracy predates the Arab Spring by at least a decade, in which basic democratic rights (elections) had been achieved without the Internet, and where—at least in some cases—elections were competitive. With few exceptions, in sub-Saharan Africa protests are couched in economic terms (see, for example, the “Walk to Work” protests in Uganda; the fuel subsidy protests—known as #OccupyNigeria—in January 2012; and ongoing protests over government failure to provide basic services to the black majority in South Africa). Crucially, protesters and their leaders south of the Sahara are not necessarily calling for the removal of their heads of state, merely for accountability—though some government officials in both cases would want to tar protestors with such a brush. Unlike the crucial role that networks like Al Jazeera played in North African protests, global news networks (in French and English) failed to cover the protests against Senegalese president Abdoulaye Wade’s campaign for a third term (he was voted out) and those by #OccupyNigeria “live” or with the same intensity and attention that were afforded the protests in North Africa. There is a tendency to fetishize the relationship between social media and the likelihood of protest. The use of mobile phones to spread information and coordinate actions was indeed widespread in some protests and disturbances in sub-Saharan African countries; take the cases of Mozambique and Mali (here and here) for example. However, and separately, research on Zambia’s recent election concludes that the impacts of online crisis monitoring and information tools during elections—like Ushahidi—may be overstated. Furthermore, new research about Twitter use suggests few elites (described as “African business and political leaders”) have joined the continent’s Twittersphere. That said, not all evidence is negligible, pointing instead to the emergence of a connected public on the continent that includes some political and policy elites. Nigeria’s president, Goodluck Jonathan, an early adopter of social media, launched his presidential run on Facebook in 2011; Jonathan’s critics also resorted to using social media, so much so that by January 2012, he had “set a world record” as the most cursed president on Facebook. In South Africa, the opposition Democratic Alliance (DA) has made social media an essential part of its political strategy, though it has also proved to be the Achilles heel of its party leader, Helen Zille. The online dominance of Zille and the DA also reflect racial disparities (still largely skewed to the small white minority) in Internet access and use in South Africa. But it is Paul Kagame, Rwanda’s longtime president, who best illustrates the potential and the paradox of social media: he manages to discredit himself while simultaneously representing an ideal path for political engagement in the digital age. His tweets, with their exclamation points, abbreviations, and numbers impersonating words, often resemble—in the words of one my students at the New School—language more suitable for texting among teens than for an elected official and are “akin to a beta release, a politician highly advanced in his tactical approach but with major problems built into the firmware.” Not surprisingly, Kagame has had his fair share of “twitterspats.” For example, in May 2011, Kagame took offense at a remark made by a British journalist, Ian Birrell, who had described him as “despotic and deluded.” For the next hour, Kagame responded in a series of tweets to Birrell. Some observers considered it the first time a head of state directly engaged with a journalist on Twitter. While the actions of Kagame and other political leaders are significant for how the public sphere is changing in Africa, their impacts pale in comparison to #Kony2012, arguably the most significant event in the short history of Africa’s place in the global public sphere. Despite criticisms about the “film” and Invisible Children (including after the public meltdown of its founder), at least for a while this will remain the template for how “the global public sphere” will engage with African issues and Africans. Mainstream journalists and commentators still attest to #Kony2012’s efficacy and usefulness. Initial criticism of #Kony2012 centered on demands for “African voices.” Mainstream media became obsessed with finding out what “African voices” say—that is, what “authentic” Africans think about the film. While this was a useful critique, it also assumed that the authenticity of the African would make the criticism “real” and add ballast to #Kony2012’s fading truthfulness. Obviously, the lack of African voices from the regions in which the Lord’s Resistance Army operates (or once operated) was part of the problem in this “activist” film, with its easy “to do” list of solutions aimed at those who are often mockingly described as “Facebook slacktivists.” But it is not clear how being “authentically African” makes someone a useful purveyor of opinion on the issue. Even Invisible Children has “African voices” on its staff. In fact, this was part of the filmmakers’ defense when they responded to criticisms. Africans can also draw uninformed (or purely self-interest driven) conclusions about what’s going on in the continent. So it is unclear if the “authenticity” of the Africans engaged in (or critiquing) any given “African” situation is the solution, per se. Perhaps the main takeaway from #Kony2012 is that the film will probably retain some salience—despite the widespread criticism against it and its makers—for how most people, including some Africans, will engage with sub-Saharan African issues for the time being. More promising are the implications of #OccupyNigeria, a series of protests that brought that country to a standstill for the first two weeks of January 2012 following an announcement by President Jonathan that he would scrap a fuel subsidy that most Nigerians considered their birthright. Hundreds of thousands of Nigerians streamed onto the streets to join marches and rallies. The national strike was only suspended after the government, following a deal brokered with trade unions, partially restored the subsidy. By most estimates #OccupyNigeria was the largest and most sustained short-term protest movement in any sub-Saharan African country in a long while. Media coverage of Nigeria during #OccupyNigeria mostly focused on alleged violence associated with protesters or linked the protests to the violence of Boko Haram, which stepped up its attacks during the strike. Certain “expert” voices in the West supported the government of Jonathan, especially his finance minister Ngozi Okonjo-Iweala. 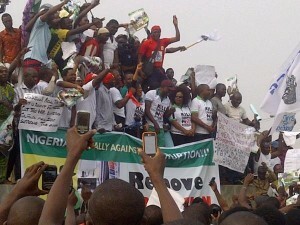 They would quickly face the backlash of Nigerian protesters. Cases in point: Jeffrey Sachs and Ethan Zuckerman. The latter to his credit, backtracked from his initial thoughts. Much of the pressure came from activists on social media, crucially in the Nigerian Diaspora. The latter also took their protests to the streets. Online activists targeted celebrities (Nollywood actors and popular singers like D’Banj) who were forced to declare their allegiance with the strike. Yet the real focus of the anger was directed toward Nigeria’s political class, especially Jonathan and Okonjo-Iweala, who were both lampooned and scoffed online. Two websites stood out: the Nigeria-based Chop Cassava (which produces video reports) and Sahara Reporters, based in New York City. Of these, Sahara Reporters has had a larger impact. Sahara Reporters has become a media force inside Nigeria largely because it is not in Nigeria. The website’s base in New York City places Sahara Reporters “beyond the reach of the politicians and corporations that the site often reports on.” What appeals to its readers and audience is the nature of the stories it reports. As Mohamed Keita of the Committee to Protect Journalists told Al Jazeera English, Sahara Reporters provides “eye witness accounts, just raw information about sensitive issues that the press in Nigeria is too afraid to publish or report.” These include extensive coverage of a huge oil spill in the Niger Delta; revealing the corruption of a state governor who was eventually tried in a British court; and events surrounding the illness, absence from Nigeria, and eventual death of President Umaru Yar’Adua in May 2010. Ordinary Nigerians have warmed to Sahara Reporters’ reporting and support it publicly. It has also attracted the attention of those in power. In some instances, Jonathan’s office has released media statements directly addressed to the site. In one celebrated case, Sahara Reporters’ story of thirty-two aides accompanying Nigeria’s first lady on an official trip to an African Union summit in Ethiopia resulted in the presidential spokesperson releasing a press statement aimed specifically at Sahara Reporters. Some concerns have been raised about sensationalism in Sahara Reporters’ style of reporting and writing. However, the conspiratorial and mocking tone of Sahara Reporters’ coverage should not be surprising. The sensationalism or the partiality to sensational stories is simply a symptom of a current Nigerian reality: that people know that they are getting screwed by the political system, and that there is a “real” beyond what is visible, dominant, or apparent in mainstream Nigerian media. What makes Sahara Reporters’ reporting “global” is not just the fact that it is transnational but also the flow and counterflow of information between New York City, Lagos, and elsewhere in Nigeria. There’s also the reciprocity between Sahara Reporters’ editors, audience, contributors, and sources, as well as its targets. One could argue that the idea of a global public is not inherently progressive or democratic and that the question “toward a global public sphere?” can be deconstructed on that basis. But it is important to remember that the public sphere, any public sphere, is a site of considerable contestation. Nancy Fraser, in her now well-worn critique of Jurgen Habermas, suggested that one should look for “actually existing” public spheres rather than impose normative ones. So while social media in some instances may replicate and reinforce the dominant racist, sexist, capitalist power that we are familiar with (as the case of #Kony2012 so vividly illustrates), it sometimes does not. It would appear that social media is also a form that can be given content, as the cases of #OccupyNigeria and Sahara Reporters would suggest. Jurgen Habermas, The Structural Transformation of the Public Sphere (Cambridge, MA: MIT, 1989). Nancy Fraser, “Rethinking the Public Sphere: A Contribution to the Critique of Actually Existing Democracy,” Social Text no. 25/26 (1990): 56–80. * This essay is based on a presentation by Sean Jacobs at the conference “Towards A Global Public Sphere” at the Center for Cultural Analysis at Rutgers University on March 30, 2012.